I missed last week’s post as I was off visiting some wonderful magical people in Florida (waves fondly at them). If any of them are reading this blog, they will immediately understand why this week’s post is dedicated to Isis (especially Heavenly Isis) and the Golden One, Hathor. 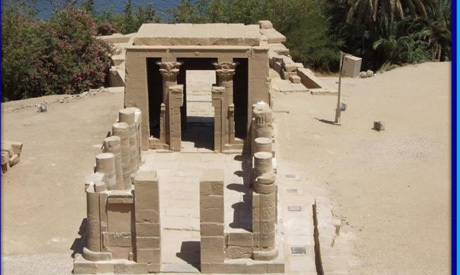 Compared to the Temple of Isis on Agilkia, the Temple of Hathor is quite small. Reciprocally and interestingly, at Denderah, Hathor’s great Ptolemaic temple complex, there is a similar small Temple of Isis. Clearly, there is a relationship between these two Great Goddesses; so much so that it was required that each Goddess would have a smaller temple near the great temple of the other. In fact, sometimes that relationship between Isis and Hathor is so close that it’s hard to tell Them apart. Beginning in the New Kingdom, we regularly see Isis wearing the Horns & Disk crown of a Cow Goddess that is emblematic of Hathor. Sometimes Isis also has a small throne on top of the Horns & Disk to indicate that She is indeed Isis rather than Hathor, sometimes She doesn’t. But guess what? Hathor sometimes borrows Isis’ headdress, too. Again at Denderah, we find a carving of Hathor—and the hieroglyphs confirm that She IS Hathor—wearing the Horns & Disk with the throne on top. I couldn’t find a great photo of it, but if you look above the disk, you see a little bump. That’s the bottom of the throne. Both Isis and Hathor are associated with Horus, Isis as His mother, Hathor sometimes as mother, sometimes as lover. 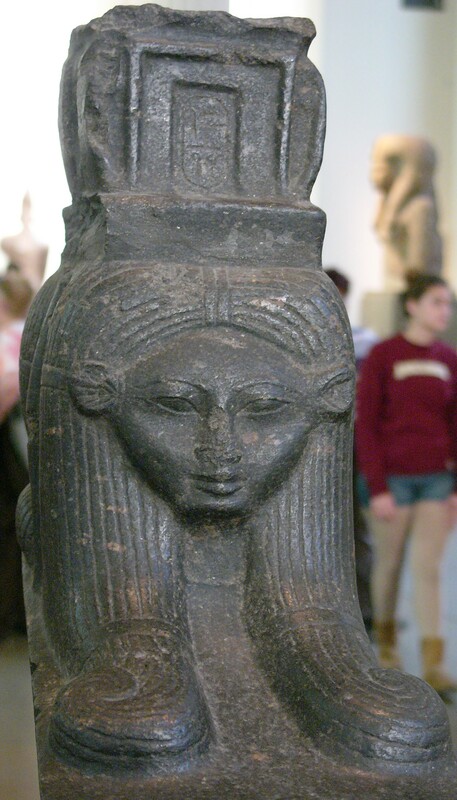 Both are Cow Goddesses and Goddesses of the Sycamore, though Hathor probably has the prior claim on both these symbols. Both are Eyes of the Divine and holy Uraeus Serpents, powerful, fiery, protective and vengeful Goddesses. Thus both can become Sekhmet, that most fierce and bloodthirsty of Goddesses. 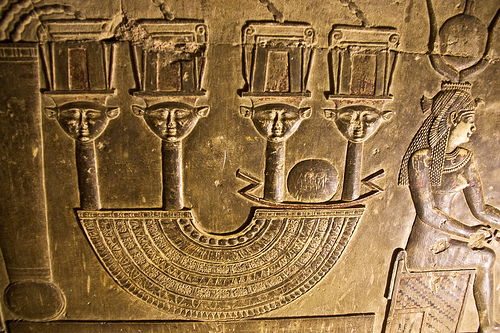 Both Isis and Hathor are Goddesses of the Otherworld, Goddesses of rebirth and resurrection, Whom the dead ones adore. Looking just as these correspondences, Isis and Hathor seem interchangeable. Is it so? I don’t think so. Instead, They are sister branches of the Divine Tree. They are ultimately united in the Tree’s trunk, yet there is a quite palpable difference in the energy feeling of the two Goddesses—at least out in the twigs and leaves of the Tree where we most often experience Them. As you know, I have an enduring dedication to Isis, but in another part of my spiritual life, I also have a strong connection to Hathor. 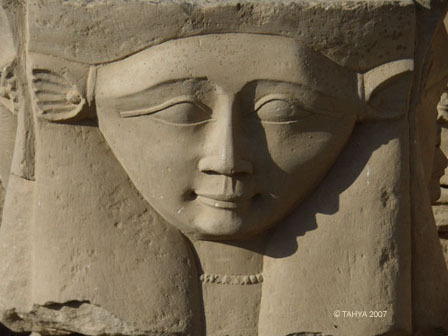 Hathor’s energy always has an underlying feeling of excitation, of arousal. It may be sexual, but it doesn’t have to be. Hathor imparts the excitement of living, and thus She is the Great Lady of Love, Joy, Drunkenness, and Dance. Her symbol par excellance is the sistrum, the sacred rattle that is shaken to stir things up. In Egyptian, to “play the sistrum” is iri sekhem, to “do power.” Hathor has something of the maenad in Her, if I may draw from a different cultural metaphor; She’s a bit more wild than Isis, more likely to roar or hiss or spit. O, but She will dance you to ecstasy; She will love you to ecstasy; She will sing you to ecstasy. Perhaps She will also put a bit of Divine terror into your belly while She’s doing it. But then She will turn Those Eyes upon you, those soft, bright, deep cow’s eyes, and She will soothe you, take you in, and make you understand that Love, only Love, is at the heart of the Divine reality. Of course, Isis, too, inspires passion. She certainly inspires it in me. But that’s not the foundation of Her energy. At Isis’ heart is strength interwoven with the numinous power of magic. Hathor’s tingle is the excitement of life and love. Isis’ tingle is heka. Yet the Mystery of the Goddesses is such that They can share many or even most of Their symbols. Blessed be the Ladies. Previous Previous post: Isis, Lady of Crocodiles? Thank you for sharing the image of Hathor I was blessed by the Goddess to photograph when visiting Her temple in Dendera. Your column took my breath away. I have been involved with Isis for many years and only recently was introduced to Hathor. She promptly stepped in and changed my life. Thank you so very much for presenting this information and doing it so well.